Gulf News, one of the leading UAE English dailies based in Dubai and widely read in Gulf region. The highest media organization in the UAE on April 13 welcomed all discussion and debate on the new draft media law, expected to be issued later in 2009, and said the new regulations provide unprecedented provisions that protect and promote freedom of expression in the country. "The draft law provides journalists freedom from coercion to reveal sources, reflecting the government's commitment to the journalistic right to protect sources; in this particular regard, the pending law's protection exceeds that of many advanced democracies, including the United States," the National Media Council (NMC), the relevant regulatory body of the Government of the UAE, said in a statement carried by WAM on April 13.. It was commenting on a report released in Dubai on April 13 by the US-based organisation Human Rights Watch (HRW) on the UAE's new draft law, aimed to regulate the media in the country. The HRW's report, 'Just the Good News, Please: New UAE Media Law Continues to Stifle Press,' states that the new law contains "some improvement" over the current media law. But it claimed the new version "will continue to punish" journalists for such infractions as "disparaging" government officials or publishing "misleading" news that "harms the country's economy." HRW said it had researched the report by analyzing the provisions of the pending law as well as interviewing foreign and local journalists based in the UAE. It claims the pending law "also includes provisions that would grant the government virtually complete control in deciding who is allowed to work as a journalist and which media organizations are allowed to operate in the country." In its statement, the NMC stressed that the report has omitted many factors and showed a lack of knowledge about the value system in the UAE. "The NMC welcomes informed discussion and debate on the content of the draft media law, whether this comes from within the UAE or from external organisations. It expresses its appreciation of the acknowledgement by HRW that the draft media law is a step forward in terms of press freedom in the UAE. At the same time, it would like to note its view that some of the remarks made in the HRW report shows either a real lack of understanding of the situation in the emirates or an attempt to promote concepts and/or procedures that are not compatible with the laws of the UAE and its value system," the NMC said. "While the NMC does not wish to comment on the HRW report point by point, it further notes that one particular point made by the report is inaccurate and misleading. Thus, while the report mentions that the newspaper Emarat Al Youm was suspended by a court order in 2008 for 20 days as a result of a conviction for defamation, the report fails to note that the paper appealed successfully to a higher court against this decision, which has, in consequence, not been implemented. a) Notwithstanding the provisions in the Press and Publications Law of 1980 relating to the potential imprisonment of journalists and other media personnel, His Highness Shaikh Mohammad Bin Rashid Al Maktoum, the Vice President and Prime Minister of the UAE and Ruler of Dubai, has directed that no journalist be sentenced to imprisonment for stories that they may write or publish, this directive now being incorporated in the draft media law, which does not include any article that could lead to the imprisonment of a journalist. b) That the draft law "instructs government institutions to facilitate information flow to the media and to respond to their requests for information." The NMC notes that, in this context, the UAE Vice President has recently set up a website designed specifically to provide a channel through which journalists, and other members of the public, may put forward questions that they may wish to have answered. c) "More significantly, the pending law provides journalists freedom from coercion to reveal sources, reflecting the government's commitment to the journalistic right to protect sources; in this particular regard, the pending law's protection exceeds that of many advanced democracies, including the United States." The NMC notes that the draft Media Law has been drawn up within a context whereby the prevailing society norms and value system of the UAE have been taken into account. It has not been designed for application in other societies, with different value systems, but is only to be applicable within the context of the UAE. 1. Has only three articles relating to potential penalties, far fewer than in the existing legislation (The Press and Publications Law of 1980). 2. Specifies only three types of story whose publication would be contrary to the law, compared to 16 types of story specified in the Press and Publications Law of 1980. 3. Provides for a right to appeal to the courts for a judicial review of any decision taken by the Government while any financial penalties provided for under the legislation can only be implemented following the completion of a due legal process. 4. Specifically refers to Article 2, which guarantees freedom of expression and opinion, whether written, verbal or by other means and, in Article 3, to the fact that there is no prior censorship of licenced media in the country. "It is the view of the NMC, that, despite the above, the HRW comments and recommendations are based to a large extent on a failure to understand fully a number of significant aspects of the draft media law. In discussions with HRW, the NMC has explained that the implementation of these aspects will be governed by executive regulations for the draft media law, which will be issued once the law itself has been approved and issued. It is the belief of the NMC that these executive regulations will satisfactorily address most of the points raised by HRW, whether technical or otherwise." A. "Amend the UAE (draft) media law to conform to international human rights law, protecting free speech by removing restrictions on criticism of the UAE Government." This recommendation relates to Article 32 of the draft media law that states that fines can be imposed as penalties on those who are deemed to "insult the person" of the head of state, his deputy or other senior federal government officials or their deputies. The article, as drafted, specifically refers to an insult "to the person" of the senior officials mentioned, not to any comment on the way in which they may perform their duties. Within the context of the system of government and the value system on the UAE, personal attacks on senior officials, relating to their personal status, beliefs or behaviour, are considered to be unacceptable, even if such personal attacks, or "insults to the person" are permissible in other countries. The NMC makes no apology for drawing a distinction between personal insults and professional forms of criticism. The NMC notes, however, that, as is the case with regards to other articles of the draft media law involving penalties, the imposition of any fines under this clause can only occur following the completion of a proper trial within the framework of the judicial process. HRW further comments, in this context: "The UAE should modify its defamation laws to exclude speech directed at public figures, particularly government personnel." The NMC notes that "public figures, including government personnel, in many, if not most, advanced countries are provided with the ability to seek legal recourse against defamation and sees no reason why public figures in the UAE should not enjoy the same right to seek legal recourse against alleged defamation. B. "Amend the UAE media law to conform to international human rights law, protecting free speech by permitting discussion of the economic crisis in the UAE." This recommendation relates to Article 33, which says, in part, that fines may be imposed as penalties for press coverage that is deemed to harm the country's reputation, foreign relations or obligations or that damages its national identity, or "harms the country's national economy"
a) Any allegation of a violation of the law with regards to the publication of "misleading" stories can only be upheld by the courts where it is proven, to the full satisfaction of the courts, that the writer of any such story was fully aware that the content of the story was "misleading" and that the writer had the deliberate intention of misleading the public and of doing harm, for example, to the national economy or to the country's foreign relations. Unless the courts are satisfied both that the writer was aware that the content of the story was false and that the writer had the full and conscious prior intention of misleading the public or of causing damage, then any allegation of a violation under the law cannot be proven and, in consequence, no penalties under the law can be imposed. b) Any legal proceedings taken against a journalist or, in some cases, a media outlet can only be taken after due warning has been given by the NMC that the information concerned is considered to be inaccurate and to have been published with the intention of misleading and/or causing damage and the journalist or media outlet concerned has, following receipt of the warning, subsequently repeated the publication of such inaccurate information. c) This article is not applicable in the case of a journalist publishing a personal opinion, the right to do this being guaranteed under Article 2, nor in the case of any story citing sources or external reports that are, in the view of the journalist, credible and well-researched. Moreover, there is no question of an offence being committed under the law for publishing news that "may harm the national economy" except where such news is "misleading or erroneous" and is known to be such by the writer. 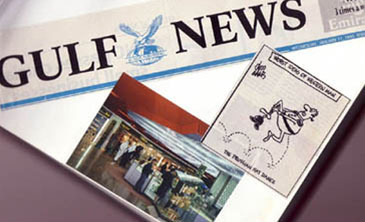 Other key phrases in this article of the draft law include "in bad faith" and "knowingly publishing of false news and information"
The NMC notes, further, that over the last few months, there have been numerous stories in the local media that have painted a negative view of aspects of the UAE economy. The NMC has taken no steps to prevent or to initiate legal action relating to such stories, based on information from external sources and reports considered by the journalists to be credible, even though the existing Press and Publications Law of 1980, now to be replaced by the draft media law, provides the NMC with the legal authority to initiate action. It is the belief of the NMC that there is already very extensive discussion of the UAE economy in the local media, as is readily apparent on a daily basis, and that, therefore, the HRW recommendation to "Amend the UAE media law to conform to international human rights law protecting free speech by permitting discussion of the economic crisis in the UAE" is both unnecessary and irrelevant, as well as being based on an inaccurate interpretation of the current situation and of the relevant article of the law. "Amend the UAE law to conform to international standards by removing unlawful (sic) barriers to entry for media organisations. The unlawful barriers include an opaque registration process and a burdensome security deposit." This recommendation refers to Article 10 of the draft media law relating to requirements for registering as a periodical, a printing house or an audio-visual broadcaster. The NMC notes that any such "barriers" under the draft media law cannot, in themselves, be "unlawful" since it is for the UAE Government to determine its own legal system and legislation. HRW suggests that "while a government may be entitled to require and regulate pro forma registration of press operations in its jurisdiction, it is an abuse of its power and an unlawful intrusion into the freedom of the press to determine arbitrarily, without clear, objective criteria, who is or is not allowed to so register and operate. Leaving such absolute power over the media in the hands of the government is an invitation for abuse..."
While the licencing of media is primarily a technical matter, which will be covered in detail by the executive regulations to be issued following the approval and issuing of the law, the NMC notes that the registration procedures are clearly defined within the draft media law. The NMC further notes that the article in the draft media law relating to a security deposit is intended to ensure that media organisations not only have the financial ability to pay any fines which may be imposed on them under the law but also that they have the capacity to meet any dues, salaries or payments due to their staff, thus providing a guarantee to employees of any such media organisations. "Include a preamble to the pending law that explicitly states that journalists should not be imprisoned or otherwise criminally punished for exercising their rights to freedom of speech, as set out in relevant international law." a) There are no articles in the draft media law that involve penalties relating to imprisonment. b) The draft media law will become part of the UAE Legislative Civil Code, not part of the Criminal Code. c) The right to freedom of speech is not only guaranteed in Article 2 of the draft media law, but is also guaranteed under the terms of the UAE Constitution. It is the view of the NMC, therefore, that such a preamble as suggested by HRW would be superfluous and unnecessary. The NMC continues to take the view that the new draft law represents a significant step forward in terms of press freedom in the UAE.